Fat Mermaid Creation Camp — Fat Kid Dance Party! I’ve been dreaming of those big blue springs around Gainesville, FL ever since my pal Shoog McDaniel moved there from Philly, forever ago. My lust to visit the Springs flourishes every Spring as Shoog plunges into them to show just how many shades of blue and green can exist in one place. I love when they add people to the mix—everyone looks like beautiful merfolk or sea creatures. Shoog writes a love letter to fat and otherwise nonconforming bodies when there’s a person on the other end of their lens. Let’s go to the Springs and create art together! Group photo shoots and creation collaborations create incredible pieces of art and valuable content for influencers, creators and fat-centered immersive nature lovers! Arrive in Gainesville and head to our private retreat space, a renovated Victorian house (built in 1865) on 20 acres of oak forest. Settle in with facilitated socializing made easy—crafts! Graze on a dinner that meets all your dietary needs out on the porch. Join the crew for night swimming in our private pool out under the Florida stars or stay cozy in the house. In the morning we’ll do a group guided meditation, have breakfast and then meet with Shoog to plan our day’s shoot! Shoog will tell us about the incredible Florida setting we are shooting with. Then we will collaborate on costumes to bring, all while gently stretching our incredible bodies so we can be ready for making art above and underwater. Our group will be 12 people and we will take turns doing individual and small group shots with Shoog. We can explore the Springs by snorkel and by foot. Rotate cheerleading and supporting whoever is in front of the lens. I’ll lead some small group reflection on the shore. We’ll work on our group video creation of a Fat Mermaid Merfolk Sea Creature dream sequence with an underwater camera. Maybe you see a manatee floating 50 feet away. After settling in we gather for Fat Kid Dance Party Aerobics. Because there’s no wrong way to do Fat Kid Dance Party you can participate as much or as little as your body is available for, and you can’t help but cheer along extra because you’re partying with new friends! Delicious dinner followed by some facilitation and fun out by the pool or inside depending on the weather. Repeat for three days of shooting—we will officially finish our programming on Sunday at 2PM for folks who have to jet back to work, but our after party goes on until Monday morning at 10AM if traveling on Monday is more fun for you! 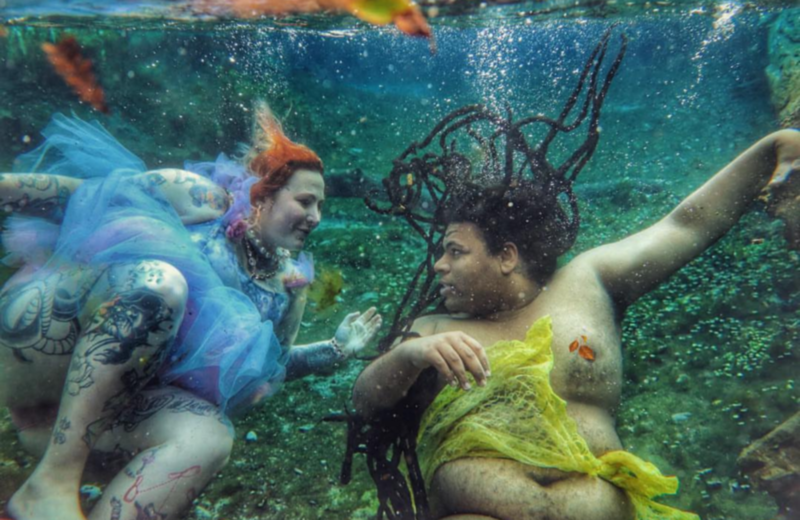 Costumes: Merfolk, mermaid, sea creature, fairy princess, gnome, Hot Topic vampire cloaks, sheer fabrics, sequins, bling, accessories, make-up you want to try underwater or in a 20 acre oak forest. Loungewear: Robes (for before and after pool/springs), loungerie, fathleisure wear, workout wear. Whatever you need to feel comfortable, and I’ll send you a packing list, I’m a Capricorn. Your art creation materials! Maybe you are a photographer, painter, musician, creator and it feels like something fun and not burdensome to bring along what you use to create if you want to add to it! So many things are possible with our time together! Everyone of all sizes is welcome to attend the retreat. Shoog takes thumb stoppers—the kind of photos that grip someone out of a scroll and into a whole new world. Visual Content for your website, Instagram, business cards, art for your walls, holiday cards, just for you memories. Shoog will produce 25-50 unedited images for each person of individual and small group shots. There’s no limit how many smart phone pics we can take above water—more if you have an underwater case. The group creation google photos album will pool everyone’s shots for easy sharing! No street lights, no car sounds, no close-by neighbors. Our house is beautifully peaceful and quiet. Deer roam the land as well as many armadillo, bunnies, squirrels, and gopher turtles. Owls can be heard at night and other birds during the day. 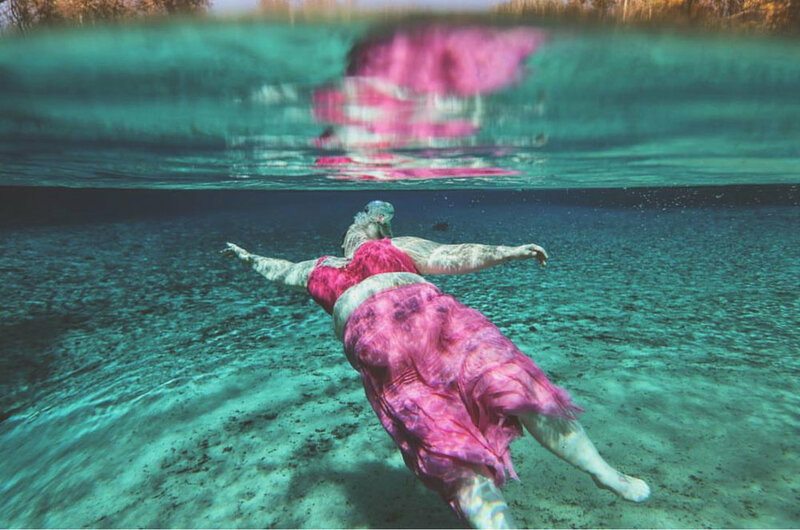 Seeing our bodies underwater is a new perspective and can be very healing for folks who have struggled to identify with and love their body. Sometimes seeing our bodies through the loving lens of another allows a new depth for our self acceptance. At this retreat we are focused on a creation of the body you have today, not ten years ago and not how you were told it should be. This beautiful, unique body. Being in the company of fat folks, gender non-conforming folks and all of the other intersections we will bring to the retreat is incredible nurturing. At this retreat we want folks to be able to feel as soft as possible. We’ll set oops/ouch guidelines as a group and ask folks to be willing to default to compassion whenever possible. The Springs are public spaces and public spaces can be hard for us on our own. Collectively creating together, taking up space together, will create a buffer and allow you to feel part of a special fat weirdo bubble. The pool at our house is our private oasis. Pool shoots and floaties are definitely part of healing, too. (They/them) I am Shoog McDaniel, a southern, queer, non-binary, fat photographer and artist living in Gainesville, Florida. I have been taking photos since high school, when a friend of mine dumpster dove 200 disposable cameras from behind a Walgreens. I became obsessed, and began documenting everything. I now shoot with a canon rebel t3i. My work is about highlighting bodies and lives that are often overlooked by popular society. I enjoy photographing fat bodies, trans bodies, and queer bodies. People`with gap-toothed smiles and missing buttons. I strive to connect the viewer of each photo to beauty within themselves, through understanding the brilliancy of diversity, by showing them that there are many ways to be beautiful. (She/her) Hi! I’m Bevin! A childhood of bullying lead to lengthy ongoing depression and epic self loathing. The body liberation movement taught me how to value myself and appreciate the body that I have been blessed with. Photography and fat-centered community are huge parts of how I came to cherish my body and love the way I look. I continue to treat ongoing chronic depression with Fat Kid Dance Party aerobics. I’m passionate about sharing tools to love yourself more and thrive! This trip is a dream coming true to collaborate with Shoog in Florida. Four night’s lodging in a single bed with a roommate or three (rooms are different sizes but all single beds). Shoog’s fee, my fee and paying for one attendee on a full scholarship. Friendships, connections, art, Fat Kid Dance Party aerobics, slumber party vibes, fairies, unicorns, mermaids, we can’t promise manatees but I’m praying for them to appear and wow wouldn’t that be amazing? Fill out this form. Once approved you’ll get the link to register via email and put down your deposit. For this retreat you can come for as little or as much as you want for maximum Florida relaxing! I know getting off work is a thing so if you can only arrive on Friday or Saturday that’s okay we’ll gracefully incorporate you into the group! I’m so glad you asked! I care a lot about making things accessible! I am already scoping for fat accessibility in the house from the photos. There are a lot of sturdy armless chairs and we can distribute them evenly throughout this vintage house so there’s always some sturdy options around the other arm chairs. There are some beds downstairs and some upstairs. I want to encourage folks who feel able and comfortable taking stairs to choose beds upstairs so folks who need to stay on the first floor can have priority to those beds. I still don’t know what we’re doing about food (hiring a chef? a full service coordinator and outside catering?) and I’m confident we can meet dietary and (hopefully) the deliciousness needs you have. I also find that being open to feedback and feedforward makes things most accessible! Shoog knows a lot about accessibility in and around the Springs and I want you to feel right at home. Let us know how we can make things easier for you! Flying with a buddy sometimes makes flying more comfortable—we’ll put retreat attendees in touch to coordinate. P.S. No diet or weight loss talk other than in consensual workshop space from a neutral perspective (I’ll teach you how). How much is the retreat? Your non-refundable deposit of 333 reserves your spot! The remainder due is sliding scale 642-842 according to your ability to pay. I encourage you to reflect on the sliding scale Jes Baker uses or if you want to dive deeper, Ride Free Fearless Money’s guide to sliding scales. One attendee will attend on a full scholarship. An ally in my community is covering their travel expenses. I also have space for one work-trade participant, email me if you would like to be considered for that position. Because much of the cost of the retreat is not reduced by late attendance or early departure it cannot be pro-rated. Flights to Gainesville from LA are about $325, $235 from NYC, $452 from Seattle as of print time. You are responsible for your transportation to and from the retreat (though we may try to coordinate coming from the airport to the center so you can split those costs). In town transportation during the retreat is covered. Four nights three days of creating, healing and splashing together. Can’t wait for you to join us in Gainesville!